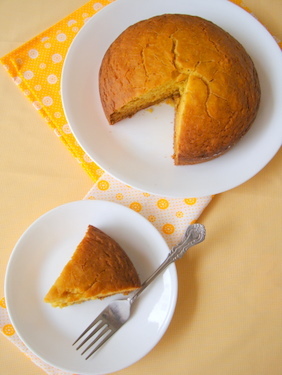 A deliciously unfussy and super quick to bring together eggless mango cake prepared in a pressure cooker. Many of you have made requests to post a recipe for a cake prepared in a pressure cooker. I got down to making one on Saturday. Its the first time I made an egg less mango cake and am quite happy with the outcome. A dense cake with a slight bread texture. Cardamom brings a fragrance and flavor of its own complimenting the flavor of mango. 1 Heat pressure cooker with lid on high for 5 mts (without the rubber gasket and whistle). Grease and flour an 8″-9″ inch aluminum baking pan. Keep aside. 2 Sieve flour, baking pwd, baking soda and salt. Add sugar and cardamom powder to the flour mixture and mix. 3 In a bowl, add vegetable oil, buttermilk and mango puree and mix well. Now, add the flour mixture and mix with the wet ingredients. Do not over mix. Gently tap the pan on the kitchen counter once to release any air bubbles. 4 Pour into the prepared aluminum tin. 5 Remove the pressure cooker lid and place a separator at the bottom of the pressure cooker. DO NOT ADD WATER. Using tongs, place the aluminum tin into the pressure cooker. Close lid and on high heat let it cook for 2 mts. 6 Reduce heat to low and cook for 40 mts. Turn off heat and do not open the lid for 5 mts. 7 After 5 mts remove the pressure cooker lid and carefully remove the aluminum pan and cool the cake for 15 mts. Overturn the cake onto a plate and slice. Note: Use at least 3 lts pressure cooker pan. Rubber gasket and whistle are not required for the process of baking a cake in the pressure cooker. There is no need to add water to the pressure cooker. We are not steaming the cake. Do not open the lid till 30 mts of cooking time. To check if cake is done, you can open the lid after 30 mts and insert a toothpick to see if the cake is done. Update: I always bake in an OTG (oven) and never in a pressure cooker. I have posted this recipe due to numerous requests made by readers for a pressure cooker cake. You have to be very cautious when using a cooker to make a cake. I suggest you use an old pressure cooker for preparing cake exclusively. I have used an old cooker. If you regularly make cake in a pressure cooker it will get damaged. Its not good to heat the cooker (without water) for long periods and is unsafe. Well done Sailu. I will try pressure cooking a cake that way but is it a must that I should be using mango puree or I can pressure cook an ordinary cake. Kindly let me know. Once again well done for brilliant ideas. You can prepare any cake of your choice in the pressure cooker. I also plan to make vanilla cake in the cooker next week and blog it too. Wow wonderful and prefectly done, beautiful looking mango cake..
What a beautiful looking cake..love the vibrant orange color..looks perfect too!! 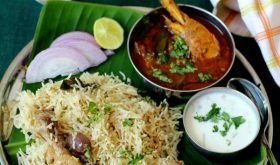 Can i use oven instead of pressure cooker. i am really very excited to make the mango cake. Yes, you can bake in the oven at 200 degree centigrade for 10 mts and then reduce to 180 degrees for 25 mts. For mango puree, is it fresh mango puree or canned puree. The reason I am asking is the consistency esp. as the canned puree will be thicker than fresh ones. Also, if we want to bake this in an oven could you pl tell the temperature and timings. You can use either fresh or canned. I used home made thick mango puree ( Banganpalli variety). Oven temp is 200 degrees centigrade for 10 mts and then reduce 180 degrees for 25 mts. For buttermilk — Can we use homemade buttermilk made with beaten yogurt + some non fat milk (if so, pl give measurements) or should it real buttermilk left after taking out butter or use store bought buttermilk? You can use home made thick buttermilk made from yogurt OR add 1/2 tbsp lemon juice to 1/2 cup of milk and let it sit for 10 mts before using. I guess it can be baked in oven as well??? Wow.. this is an excellent inspiration to start using pressure cooker for baking sailu… awesome recipe.. thanks for sharing..
Cake looks delicious Sailu! Must try, thanks for a great recipe again. 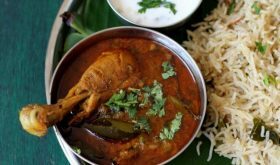 Wonderful Recipe.. Can I use a thick bottomed steel utensil for this?? I dont seem to have anything aluminium with me..
Aluminum works best. I wouldn’t use stainless steel. i am a huge fan of yr recipes. i cooked many of yr recipes and got loads of compliments. even my nephew loves them. I have a small question. could you please tell me how to bake a cake in a microwave oven? i have an LG MC 7647 that serves both as microwave and oven please do reply. awaitin yr reply eagerly. One more thing, what do you mean by placing a separator in the cooker? i could not understand that, so could you please explain. Can i cook eggless chocolate cake this way? please reply. Thank you. I have never baked in a MW, Tiya. By separator I meant the cooker plate with holes that is usually placed in the bottom of the cooker before placing any vessel of dal, rice etc that needs to be cooked. If you do not have it then layer the bottom of an old cooker with sand (1 1/2 inches height). Yes, you can prepare eggless chocolate cake using the same method of cooking. Wouldnt the cooker bottome be burnt without water? Please reply, while cooking rice it gets burnt when the water is dried up. The cake will not get burnt but the bottom of the cooker will be charred to some extent. I suggest you use an old pressure cooker for preparing cake exclusively. I have used an old cooker. If you regularly make cake in a pressure cooker it will get damaged. Its not good to heat the cooker (without water) for long periods and is unsafe. cake is looking really delicious.. certainly would love to give it a try..i had a doubt..what works best separator or putting sand?? please do share pressure cooker vanilla cake soon..
I’d suggest you go with sand. 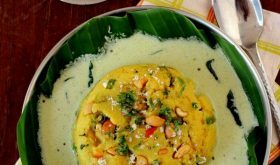 How to prepare the mango puree?? Is it same as mango juice or do i need to add any other contents into it. Take a large ripe mango. Peel and cube. Blend in a mixer grinder without any water. Your mango puree is ready to be used for the cake. It should measure about 3/4 cup. I made this just now and it came out well. I forgot to add the cardamom powder ( kids at home and making a ruckus..) but still it came out well. To Tiya who wanted to know whether it could be made in microwave.. I put this in a oven + microwave safe silicon dish, then put it in microwave mode, for 3 minutes, and then on grill mode at 180 c for 4 minutes. Leave it in microwave for another 5 minutes. ( this is the way I make all my cakes, but microwave timings vary according to wattage. you need to try and find out how much time yours will take) Cake was perfect, of course the golden brown color was little less, but the taste was so good. Is this the same proportion to bake in an OTG. How much preheat and cook temp would you recommend?? wonderful looking cake ! Is it the same proportion if baked in an OTG too?? What temp would you suggest to preheat and bake? Sorry for the delay in my reply to your query. Yes you can bake the same proportion in an OTG too. Pre-heat oven temp at 200 degrees centigrade for 10 mts and bake at 200 C for 10 mts and then reduce 180 degrees for 25 mts. I tried this cake of yours in convection oven. It came out yummilicious, I had brought it to office and all my colleagues enjoyed it a lot. I have blogged about it. Please check the below link. Thanks so much for sharing. I have tried the cake, thanks for routing me to this page. The color and taste turned out fine but the inside of it is soft and uncooked and not nicely porous like yours. Can you suggest on what might have gone wrong? I would like to know can we use milk instead of buttermik? Add a tbsp of vinegar to a cup of milk and leave aside for 1-2 mts. Use it in place of buttermilk. What is the temp if prepared in OTG? 1cup is equal to how many gms? 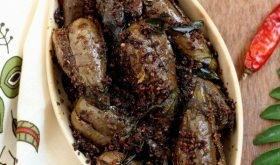 i just stumbled across your blog and love the recipes. How do you bake this eggless cake in an oven? hi sailaja, i tried out ur cake recipe. I have used butter scotch essense and milk. cake dint get burnt but taste was worst. it tasted bitter. wat could have gone worng? Before I got an electric oven, I used a biggish kadai in which I put some sand, about 2 inches of it and let it get hot, I then put the cake tin in it and covered with a domed lid – like the one we use in an old fashioned idli maker and let it bake for the recommended time. The cakes came out well, so this is an alternative for those who may not have an old pressure cooker to spare. This looks too amazing for words. And eggless? Wow. Your recipes are clear, unfussy and easy to make – eggless choc cake came out great, light and fluffy, even though I used atta instead of maida. I’d like to try this recipe with melted butter instead of oil, and bake it in the oven at the temp you have specified in the comments. Would using butter instead of oil alter anything? Hello Sailu, just wondering if you have a recipe for cake to cook in a microwave? 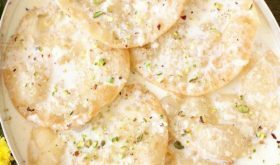 Can you please post the same recipe than can be made in regular conventional electric oven. 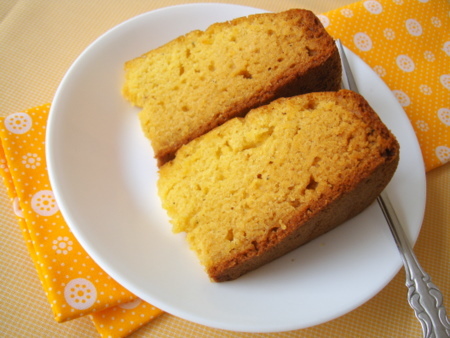 Yesterday i prepared the mango cake…….I used stainless steel bowl as I was nt hvng aluminium one… it was really soft and tasty….. a little bitter taste was there when one swallows it……can u plz tell me why is it so???????????? Maybe you added more baking soda and baking powder than required. Reduce the quantity next time you make it. Hi sailu can you please tell me how to make this cake in a microwave oven? I have tried this cake today and followed your recipe to the T. The color and taste turned out fine but the inside of it is soft and uncooked and not nicely porous like yours. Can you suggest on what might have gone wrong? The cake came out nice and soft. But it was not as dry looking as yours. I felt I could use less oil? And also I have a convection oven, had to use slightly higher temperature ~300. Can I use Mango pulp instead??? mam thanks for this great recipe but i wanted to ask u that the sugar that u used in ur recipe is the normal granulated sugar or castor sugar coz i have only normal granulated sugar.Plz do reply i have tried to make cakes many times but it never came out nice so once again i want to try this recipe and thats why i am a littile bit worried. Instead of heating an empty cooker, use sand in place of water and keep the cake tin over the preheated sand which will save both the pressure cooker as well as the cake will be done fast and get cooked evenly. I use sand at the bottom of the pressure cooker whenever I use the pressure cooker for baking cake. Bake at 175 C for 20 mts. Check from 15 mts onwards. Mango whipped cream works good. Once the whipped cream reaches soft peaks, add a bit of mango pulp and beat to stiff peaks. Frost as required. Your recipes are awesome. 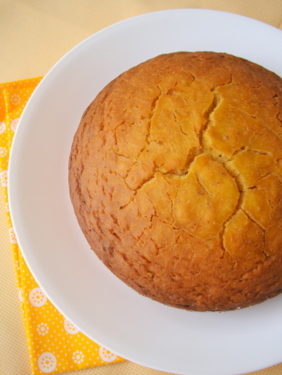 This weekend I want to try this Pressure Cooker Mango Cake. I have a doubt. If we don’t put wate into cooker and continuously heat it for 40 min, does it not burn the cooker. Do we have to take care of anything else? Remove the rubber gasket while heating the cake. You will not face any issues.